Pau D’Arco extract (Tabebuia impetiginosa) is derived from the bark of a giant hardwood tree that is native to the Amazon rainforest in South America. 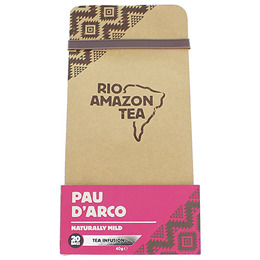 Also known as `Purple Lapacho` - infusions prrepared from the bark of Pau D`Arco trees have been used by many rainforest tribes for over two thousand years to contribute to the immune system. Shredded Pau d’Arco (Tabebuia impetiginosa) bark. Infuse one bag in a cup of boiling water and allow to stand for 3-5 minutes. Drink and enjoy! Below are reviews of RIO AMAZON Pau D`Arco - 20 Teabags by bodykind customers. If you have tried this product we'd love to hear what you think so please leave a review. I buy these tea bags for my son who suffers from ME. He enjoys drinking the tea and believes it helps him to manage his condition. Love these tea bags and really nice mild taste. They really help my stomach. Arrived within a couple of days. Great for keeping my gut healthy. I've been on the candida diet for 6 weeks I've been drinking pau d'arco since I started it's really helped. It tastes really good too!